There are numerous extensions in Chrome Web Store which replace the new tab interface. There are extensions to see your Google Photos, get news feed from multiple sources, get daily facts, track price of cryptocurrencies, bring all your tasks from various platforms, and more. There is even an extension that lets you make company announcements via Chrome’s new tab. In this article, I will cover another free extension that you can add to Google Chrome. 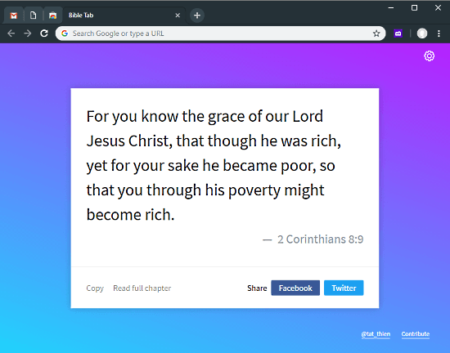 This Chrome extension shows random Bible verses in new tab. This way, you have something to read whenever you open a new tab. Also, it could help you learn Bible verse easily. So, let’s check it out in details. 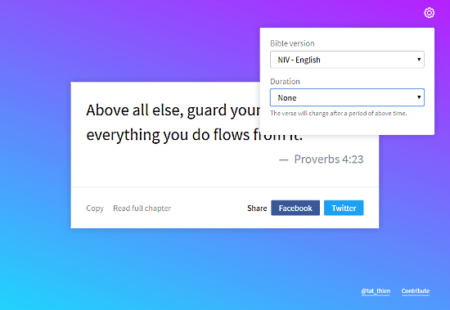 Bible Tab is a free Google Chrome extension which you can add to your browser from the Chrome Web Store. You can find a link to this extension at the end of this article. After adding this extension, whenever you open a new tab, it shows you a random verse from the Bible. It also adds the chapter from which the verse is taken. At the bottom of the verse, there are social media buttons to share the verses on Facebook and Twitter. Along with that, there are two more options: one to copy the verse to the clipboard and other to read the full chapter from which that verse is taken. The “Read full chapter” option takes you to the Bible.com website where you can read the chapter. In case the verses you get are not in English, that’s probably because of the selected Bible version. You can easily switch the Bible version to get the verses in English. To do that, tap on the gear-shaped icon present at the top right corner. This opens two options; Bible version and Duration. At the time of this writing, this extension has two Bible versions: NIV English and VP1925 – Vietnamese. By default, this extension shows a new verse whenever you open a new tab. However, you can set a time duration for a verse if you want. You can set it to 1-hour, 6-hour, 12-hour, or a day. When you set the duration to a specific interval, this extension shows the same verse for that interval no matter how many new tabs you open. Get Bible Tab from Chrome Web Store here. Bible Tab is a decent extension to get random Bible verses in the new tab. With this extension installed, you get something new to read instead of the same boring new tab interface.